The butterfly gets nectar from the flower, and as it moves from blossom to blossom, it pollinates the flower in return. 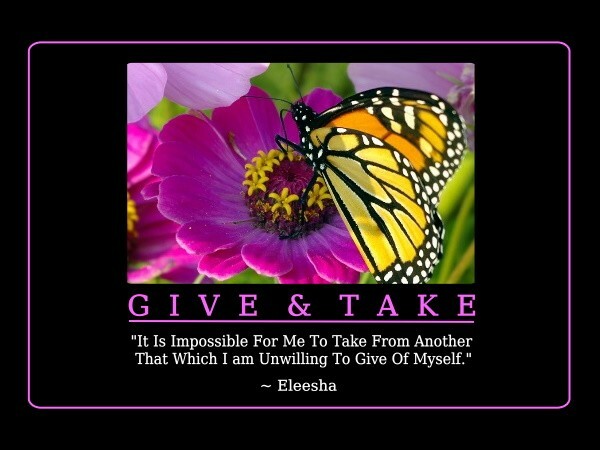 In the same manner, we need to give and take in equal amounts. Take time for yourself or reward yourself in some way in appreciation of all you give to others in the course of your day. This entry was posted in dont use and tagged balance, divine message for the week, divinelovedivinelife.com, give and take, inspiration, inspirational, Inspirational Quotes, reward, self help, spiritual, treat. Bookmark the permalink.